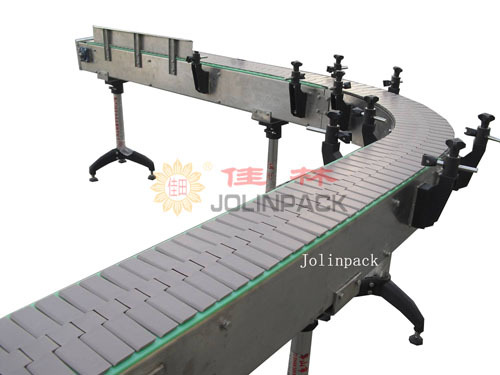 This kind of conveyor is add the plate type component between the two sides chain of the conveyor, to convey the irregular products, if add the special clamping apparatus on the chain plate, it can be used as assembling line, it also can fulfill the curved conveying if adopt the plastic steel flat-top chain or stainless steel flat-top chain as conveying carrier. Slat Chain Conveyor adopts special chain, aluminum frame, beautiful shape. Set the following structure, pallets & fixtures, pneumatic stopper, pneumatic lift-up conveying platform, etc. Pallets & fixtures return method can be up and down or side return to meet different requirement. Conveying method: freedom beat and forced tempo. Frame material can adopt carbon steel or stainless steel; plate type component can adopt different kinds of material.